‘New Orleans Down The Hatch’ Bellies Up To The Bar This July! Opening at K-Joe’s restaurant in the French Quarter July 15, New Orleans Down the Hatch: A Cabaret in Two Cocktails celebrates the history of New Orleans through an evening of song and tasty cocktails. 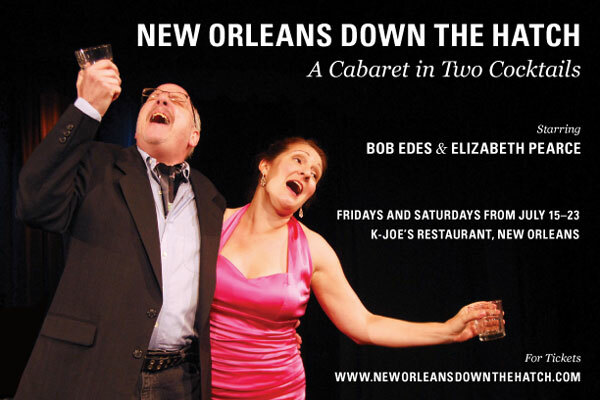 The show, nominated for the Big Easy Award for Best Cabaret in 2010, stars some Running With Scissors regulars, including Big Easy Theatre Person of the Year Bob Edes and New Orleans culinary historian Elizabeth Pearce. Tinkling the ivories, you’ll find the lovely and talented pianist Jim Walpole. The show will run Fridays and Saturdays at 8pm from July 15 through July 23 at K-Joe’s, 720 St. Louis in New Orleans’ historic French Quarter. Tickets are $25 and includes a free Sazerac and Hurricane for each audience member. Want more info? Check this video clip taken from a performance at Le Chat! A regular on New Orleans’ stages, Bob Edes is one of the Crescent City’s most sought after actors. He has been awarded multiple Big Easy Best Actor Awards and was named 2010 New Orleans Theater Person of the Year. He frequently performs with the Running With Scissors theatre company. Elizabeth Pearce is a culinary historian, regularly giving presentations and tours showcasing New Orleans history. She directs the hearth cooking program at the Hermann-Grima + Gallier Historic Houses in the French Quarter and is a Senior Curator at the Southern Food and Beverage Museum. She is also a member of Running with Scissors theatre company. Jim Walpole is a classically trained pianist. He has performed in and directed musical events in theatres and other venues throughout New Orleans. Since 2003, he has served as President of Guild of Le Petit Theatre de Vieux Carre, one of the oldest theatres in the United States. Purchase tickets for “New Orleans Down the Hatch” now by clicking here! After a sold-out weekend run, musical powerhouse, Running With Scissors starlet, and Big Easy Award-winning actress Dorian Rush is back! For one night only — Wednesday, October 21 — Dorian plays Janis Joplin in LIVIN’ JANIS, a completely un-authorized, biographical, music homage to the late great rock legend. Ride the highs and lows of Janis’ life as she travels from Port Arthur, Texas to the glitz of California, rolling from bed to bed and cocktail to cocktail in a never-ending quest to wring the pleasure out of life at the cultural crossroads of the 1960s. As Janis, Dorian will rock the house with long time bandmate Michael Sollars on drums, Brian Broussard on bass, and local celebrity rock star extraordinaire Bill Davis (otherwise known as the man behind Dash Rip Rock) on guitar. LIVIN’ JANIS runs at Le Chat Noir for one performances only: Wednesday, October 21 at 8pm. Tickets are just $26 — and that includes a $5 bar credit! Make your reservations today for this unforgettable original theatre work: click here to order tickets online, or call 504 581 5812. After a sold-out weekend run, musical powerhouse, Running With Scissors starlet, and Big Easy Award-winning actress Dorian Rush is back! For one night only — Thursday, August 27 — Dorian plays Janis Joplin in LIVIN’ JANIS, a completely un-authorized, biographical, music homage to the late great rock legend. Ride the highs and lows of Janis’ life as she travels from Port Arthur, Texas to the glitz of California, rolling from bed to bed and cocktail to cocktail in a never-ending quest to wring the pleasure out of life at the cultural crossroads of the 1960s. 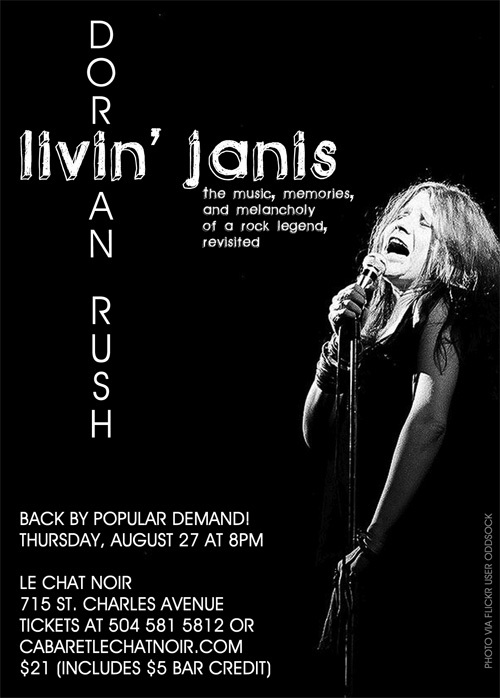 LIVIN’ JANIS runs at Le Chat Noir for one performances only: Thursday, August 27 at 8pm. Tickets are just $21 — and that includes a $5 bar credit! Make your reservations today for this unforgettable original theatre work: click here to order tickets online, or call 504 581 5812. For one weekend only, musical powerhouse, Running With Scissors starlet, and Big Easy Award-winning actress Dorian Rush plays Janis Joplin in LIVIN’ JANIS, a completely un-authorized, biographical, music homage to the late great rock legend. Ride the highs and lows of Janis’ life as she travels from Port Arthur, Texas to the glitz of California, rolling from bed to bed and cocktail to cocktail in a never-ending quest to wring the pleasure out of life at the cultural crossroads of the 1960s. LIVIN’ JANIS runs at Le Chat Noir for three performances only: August 7, 8, and 9. Showtimes are Friday and Saturday at 8pm, Sunday at 6pm. Tickets are just $21 — and that includes a $5 bar credit! Make your reservations today for this unforgettable original theatre work: click here to order tickets online, or call 504 581 5812. 1. Come to the event on the night of June 9th and bid on some of our amazing silent auction items, donated by artists and businesses from across the country. There are travel packages, great artwork, gift certificates to New Orleans’ ourstanding restaurants, and much, much more. 2. Make a donation to Lisa’s fund quickly and securely through Paypal. Just click the button below! Join us at Le Chat Noir for a very special night of music, theatre, stand-up, and more–all to benefit one of New Orleans’ most beloved young actresses, Lisa Picone! The fun begins at 6:30 with a fabulous silent auction. Bid on jewelry, artwork, gift certificates, and more in the luxe Le Chat bar. At 8:00, we’ll move into the cabaret room for an evening of entertainment hosted by Brian Peterson and Todd Shaffer, with performances by Natalie Boyd, Debbie Davis, Bill Dykes, Bob Edes, Jr., Ricky Graham, Sean Patterson, Elizabeth Pearce, Gary Rucker, Dorian Rush, Jessie Terrebonne, Anthony Sears, Cammie West, and The UNO Jazz Consortium featuring Sasha Masakowski. And yes: wigs are totally encouraged!